The topography of the Picos makes them notoriously complicated to navigate, the karstification process having compounded the effects of glaciation by creating deep hollows (hoyos) and vertical mountain walls. (Espeologists can explore some of the deepest caves in Europe). Water is scarce in the high Picos with only occasional, small springs. 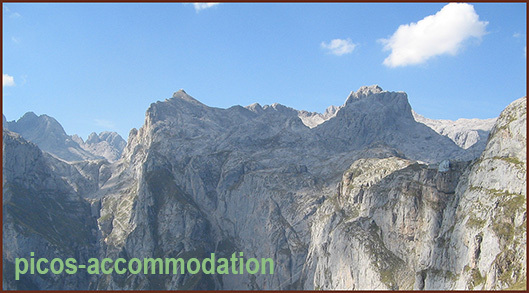 Among the highest peaks are Torre de Cerredo (2,648m), Torre de Llambrión (2,642m), Peña Vieja (2,613m) and Peña Santa de Castilla (2,596m), although the most well-known is El Naranjo de Bulnes (2,519m), aka Picu Urriello in the local dialect. This lump of a mountain sticks up like a thumb from the central massif and, along with the rest of the range, can be seen, on a clear day, from the coast. According to legend, the Picos de Europa were so named by northern European sailors approaching the Costa Verde from the Bay of Biscay. 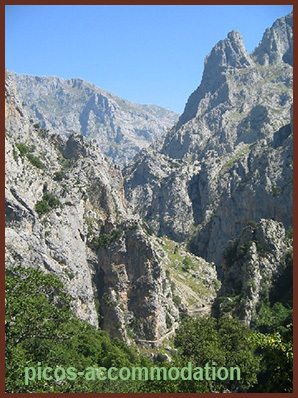 One of the most popular walks for visitors is the path along the Cares gorge or Garganta del Cares. Not for the vertigo-prone, this track was carved out of the western face of the gorge during the 1920s while making an 11km feeding canal for the hydro-electricity station in Poncebos - an amazing feat of engineering for those times. Covadonga, in the western massif, was the site of a battle (or a skirmish depending on points of view) in the year 722 in which an army led by Don Pelayo defeated a Moorish invasion attempt. Using their knowledge of the precipitous terrain, the Asturians led the Arabs into the mountains and then ambushed them, making for the first defeat of the Arabs and leading to the Christian Reconquest of Spain. The surviving Arabs fled over the Picos via the lakes above Covadonga, now another popular tourist attraction, only to be engulfed in a landslide at Cosgaya in the Camaleño valley on the other side. Don Pelayo was declared the first king of Asturias and Cangas de Onis its' first capital. The grotto near the Basílica de Covadonga houses Don Pelayos' tomb along with the Virgen, or Santina, of Covadonga and is the second most important Catholic site in Spain. 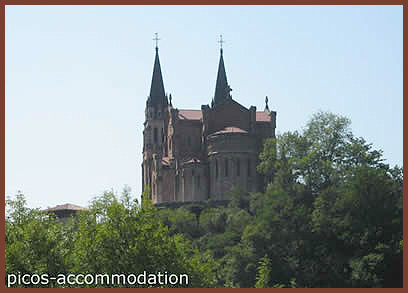 Around the same time, a monastery was founded in Liébana. Originally named the monastery of San Martín of Turieno and Benedictine in order, it later evolved into Santo Toríbio and became Franciscan. The gothic church that now stands on the site, 2km from Potes, dates back to 1256 and is home to the Lignum Crucis, reputedly a piece of the holy cross on which Christ was crucified. 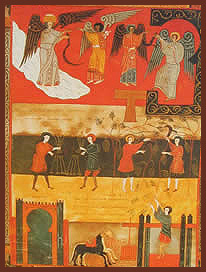 The works of an 8th century monk, Beato de Liébana, are also kept here including some colourful works of art displayed in a permanent exhibition in the church cloisters. The monastery now standing next to the church was built in the 17th century and restored in 1961. 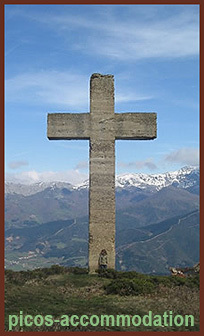 A huge, concrete cross on the hill of La Viorna above dominates the view over Potes. Santo Toríbio is the third most important Catholic site in Spain. Both holy sites are obligitory stopping points on the pilgrimage to the most important, Santiago de Compostela - journeys' end. Five minutes drive or forty five minutes walk from the ancient, market town of Potes, thirty minutes from the cable-car at Fuente De and forty five minutes from the coast, Casa Gustavo makes an ideal base for a holiday in Cantabria. Roads leading into the valleys of Liébana are the N621 from Unquera, which brings you through the dramatic Desfiladero de La Hermida gorge, the N621 from León, descending from the San Glorio pass with its' spectacular views, or the C627 from Palencia direction, winding its' way down from the Piedrasluengas pass. 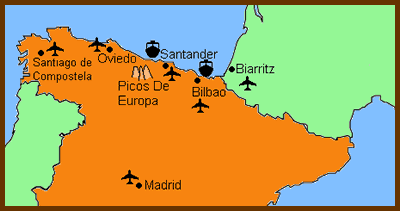 Cheap flight deals can be found with Ryanair into Santander or Easyjet into Bilbao or Oviedo. 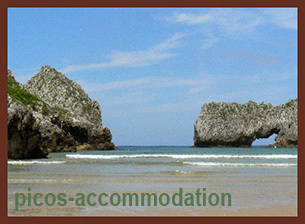 (The flexibility of these has enabled guests to, for example, fly into Santiago de Compostela & fly out from Biarritz ). For those wishing to lessen their travel impact on global warming visit www.seat61.com or "The Man in Seat Sixty-One" - an excellent site for train aficionados. Travelling by sea, Brittany Ferries sail from Portsmouth and Plymouth and now run an economy service as a cheaper alternative. Buses run regularly along the coast with the local (Santander/Potes) bus stopping 5 minutes walk from the house, 2/3 times a day. See bus timetables here.